When a gravitational wave passes by it stretches space in one direction, and squeezes it in the other. We can use a type of instrument called a laser interferometer to measure this effect. When a gravitational wave passes it stretches and squeezes the arms of an interferometer. The distances between the beam splitter (black) and the end mirrors (blue) alternately increase and decrease. The photodiode (green) observes an interference pattern in the combined laser light. Cartoon modified from Abbot et al. (2009). A laser interferometer works by shining a laser beam onto a half-silvered mirror, which we call a beam splitter. This mirror reflects half the light that hits it, and lets the other half pass through. We can angle this mirror so that half the light is reflected off to the side and the other half travels straight on, forming an L-shape. These two halves of the laser then each shine off a mirror and are reflected back to the beam splitter where they are joined together again. We use a photodiode to measure how the two halves interfere with each other as they are combined. 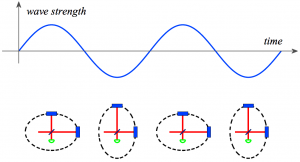 If both halves travel exactly the same distance they will interfere in a way that makes the photodiode see no light. But if the distances are different, even only slightly, the interference will mean a little light is detected. We already know that if we build a laser interferometer and a gravitational wave passes by, it can make space stretch and squeeze so that one arm of the L-shape gets a little longer, and the other arm gets a little shorter. So our instrument should show a pattern of light interference whenever a gravitational wave passes by. The LIGO (Laser Interferometer Gravitational-Wave Observatory) is, as its name suggests, just such an instrument. In fact, two giant interferometers make up LIGO. They are located 3,000 km apart in the USA; one at Hanford, Washington and the other at Livingston, Louisiana. They were built so far apart because a gravitational wave, which travels at the speed of light, will arrive at each instrument at slightly different times. That helps to narrow down the direction it came from. Each one has 4 km long arms where very powerful lasers are fired along vacuum tubes to large, ultra-pure, highly polished mirrors. A strong gravitational wave from space, like one from the collision of two black holes, will only change the length of the arms by 1 part in a billion trillion (1,000,000,000,000,000,000,000). That means the 4 km distance between the beam splitter and the end mirror in LIGO changes by 0.1% the size of an atomic nucleus. Yet LIGO is sensitive enough to measure this effect. 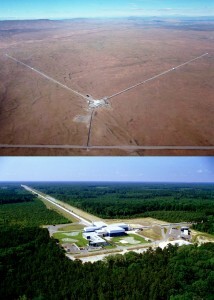 The LIGO Hanford (top) and Livingston (bottom) observatories. Unfortunately, gravitational waves are not the only things that can make LIGO’s mirrors move by this microscopic amount. Vibrations from distant traffic, bad weather, and tiny earthquakes all pose problems as they can mask the effect of gravitational waves. Even the miniscule jiggling of atoms in the mirrors, tiny fluctuations in the laser light, and interference from electronic equipment inside the detector can be troublesome. The LIGO detectors operated from 2002 to 2010, then were switched off for upgrades to turn them into Advanced LIGO. In September 2015 upgrades were completed and the observatories began taking data again. They were more than three times more sensitive than the best measurements made before the upgrades, and by 2019 they should be 10 times better than they were. This will raise the chances of detecting a gravitational wave by a factor of 1,000, so the hope is that Advanced LIGO may make the first ever direct detections of gravitational waves.